I am so happy with my new fall mix. Thank you Leslie! I bet you have the most marvelous falls in Seattle! I enjoyed following along on your Malibu adventurers on IG. Thank you my dear! I so enjoyed your post with fashion and chairs! Thank you so very much my darling daughter! Miss you SO! Tamera, that top picture of you is drop dead gorgeous! Love the look...the setting...and how stunning and joyful you look. Thanks for inspiring all of us to go farther and have fun with fashion! Thank you dear Pam for your kind words! Thank you Paula! I envy your NE perfect falls!! Great look as always. I must say those brocade slacks are beyond fabulous! Loving the t straps with them. Simply inspirational. Thank you Barb! Boy... is your daughter's wedding getting close! I send you much love! Fabulous mix here, love these lively pictures! Thank you Ann! Loved the composition in your opening photo! Stunning. Just stunning photos and outfit. 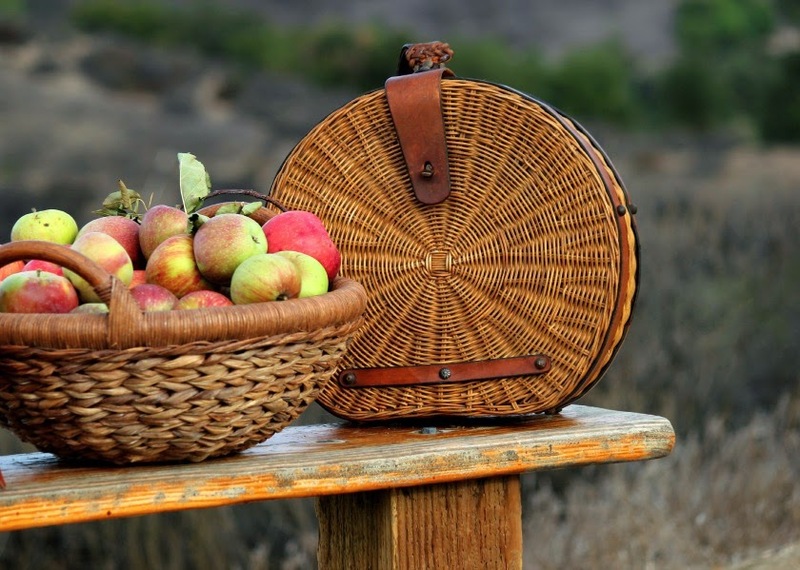 The styling of the photos is great too, the apples and the wicker, the bag and the apples. Did you take the photos on a bench? I have to say...should you ever feel so inclined as to no longer require that bag, I will gladly take it off your hands! It has me drooling, and I don't even like bags. Thank you Suzanne! I did shoot the pieces on a bench on the trail. The bag is a Dooney and Bourke... I got it two years ago for my trip to Napa... and i still love it! Wow, you look like a star. I love that outfit. Your pictures are always so lovely. Thank you Marla! Enjoyed your Target tips! Thank you Patti! Thank you again for hosting Visible Monday! Hasn't the weather been just fabulous? I adore those brocade pants, especially mixed with the striped top. What a gorgeous, luxe look! such irony my dear... I was just commenting on your gorgeous stripe sweater! Love. these. combos!! All from your wardrobe? That's a clever closet, indeed. Thank you my dear1 And yes... i do love playing in my closet... It is to me...what paints are to an artist. i so enjoyed tracing back your the story of your Parisian Max Mara MOTB dress! I knew we were going to be in for a treat when you announced last week that you were gathering your fall wardrobe, but I had NO idea it would be this special. Wait, yes, I kind of did, it's you I'm talking about. This is just awe-inspiring. Perfect way to bring in Fall in grandiose fashion, my friend. And, talk about layering with detail and surprise, just lovely. I especially like the pop of fuscia in the one photo with those fun shoes. Trina my friend.... you are too kind! Thank you so very much for the sweet, sweet words!! I see that you closet is full of wonder! I'm very taken with the brocade ankle pants. Thank you Judith! Coming from a woman with an entire room of hats... those are dear words to be sure! Great outfit Tamera, I will have to pull out my fur vest!! That's the theme this year! "Shop your closet!" Thank you dear Gabriala! Love YOU! The brocade pants are gorgeous! I am so looking forward to cooler weather but unfortunately here in Dubai we have to brace another couple of months of summer and the last bit is normally very humid! Mrs C ... wow... i had no idea you have a couple of months left of summer in Dubai! Gorgeous pants! You can see on the pictures that the fabric is a high quality. Love your shoes, they are wonderful, so elegant and stylish. Dana Jo thank you very much!! Thank you dear Curtise! So enjoyed the weekend stroll in your neck of the woods! Wished I was in the UK, so I could join your blogger meet up with you and Vix!! I love this! So chic. I'm so into vests these days. Thanks Wendy! I got a kick out of your Emmy fashion rundown... and your article in the Huffington post. I 'm loving this ensemble, very funky and chic! Thank you Ariane! I appreciated your run down on Woody Allen's latest movie... I am now intrigued! Thank you my dear! I enjoyed your pattern inspirations! Beata thank you so much... and for visiting from London! I liked the leather jacket with your red dress! Have a great week, beautiful lady! Jan thank you for your kind comments...I especially got a kick out of your overall comments :)) I suppose your are right about the bag over the apple basket... they are heavier than you'd think! Wishing you a wonderful week as well! My husband is flying home from Georgia today and has spoke of your lovely weather. It is still warm here too..The day I shot these photos... it was just a fall teaser day... but at least it was a reminder of chillier days to come! Oui, oui, oui-I love it all. When we meet next month I will sit at your feet and watch you put together one of these fabulous outfits. You are gifted!! I will be bringing my fashion designer sister (Dorie from St. John Knit) to join us. Thanks for the invite. She is excited. You will love her. Can't wait. Gorgeous post! Heather I am so excited for your visit and the opportunity to meet your sister Dorie! What an amazing sister story the two of you must have! Thank you Zalina! I am so impressed you are able to take your own photos! Well done! I really like all the contrast in this outfit--the more casual top with the brocade pants! A very cool mix of colors and textures! Thank you Rachel! I loved your story of the letter! Thank you Chioma! I can see from your blog we share a love of similar styles! Great mixing of leopard and stripes! 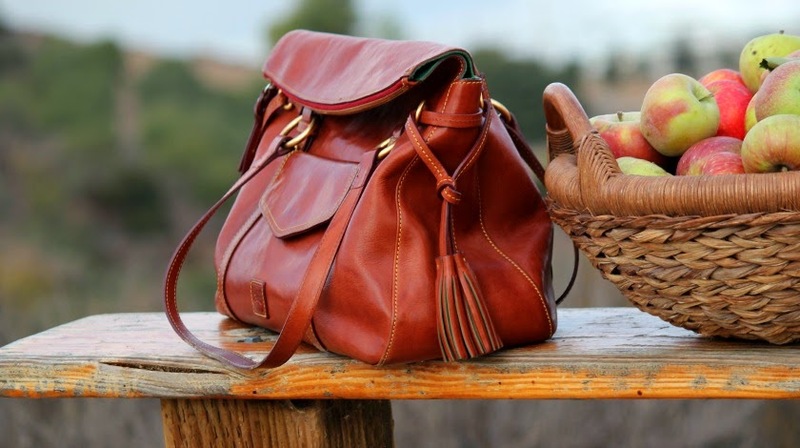 I am loving that handbag - the hue is perfection for fall! Thank you Lisa! I do enjoy pulling out this bag ... it always makes me know it's truly time to celebrate fall! Your post 'awash in color' was a brilliant use of color and composition! Thank you Diana! Thanks for visiting from South Korea! Gorgeous! I'm in love with those shoes! Brilliant layering my dear! Love the contrasting patterns and textures! Tamera, love this so much I came back for seconds. xoxo!! !